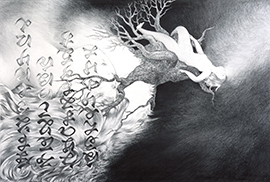 The exhibition of Kondoh Akino “Kiya Kiya 1/15 sec.” will be presented at Mizuma Art Gallery from August 21st to September 28th. Last year, Kondoh published a collection of essays “Mysteriously quiet talk” with the help of Nanaroku-sha. Also, her manga “Thinking about it in New York” has been serialized in online magazine Matogrosso every two weeks. The term “KiyaKiya” comes from the old Japanese expression “mune ga kiyakiya suru.” and is coined to denote “an enigmatic, nostalgic, disturbing feeling,” or an impression of “deja-vu”. Created in 2011, the animation of “Kiya Kiya” is a 6 and half minutes story about a little girl, who is living and gradually changing in three different time axes. Every second of this 6 and half minutes video consists of 15 drawings. It is simultaneously a 6 and half minute video and an accumulation of 1/15 seconds. The artist considers that when they encounter each other, the viewer can feel the possibility of the existence of another parallel world and time axis. —We keep in our memory a lot of flashbacks, but sometimes we could forget what happened with us, where we were during this moment, when it was and with whom. Yet intervals, the “density of time” and “sense of distance from the present”, are different. We can think that what is happening “in front of us” is “the present”, but actually what is also arising “beyond our eyes” is happening at that moment. Besides, everybody has his own perception of “the present”. During several years of creating the “Kiya Kiya” series, Kondoh Akino has started seriously working on the idea of time. In this process, the artist became interested in such subjects whenever she had “a feeling that time exists at a different density”, and it made her feel “a sense of Kiya Kiya”. 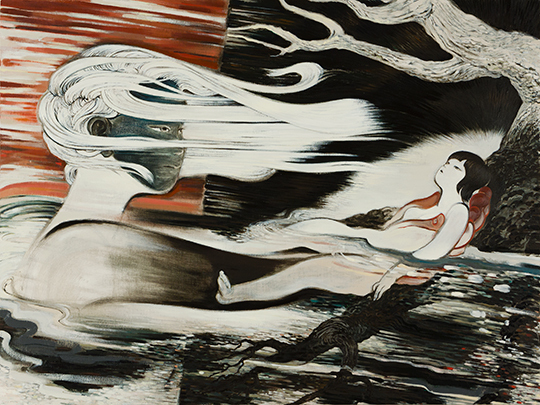 This time, the drawing and oil paintings will be exhibited from the “Kiya Kiya” series. Animation conveys the way of seizing different times by showing how quickly 1/15 second ends, and the non-existence of time. At the same time, another show, ‘The “KiyaKiya” Drawings’ will be held at A/D gallery (Roppongi Hills) from August 24th to September 16th. In this show, the animation drawings which are the 1/15 sec. and the backgrounds will be exhibitied. “KiyaKiya-Animation Drawings” and the first artist book “Kondoh Akino” will be published to coincide with the shows at the end of August.